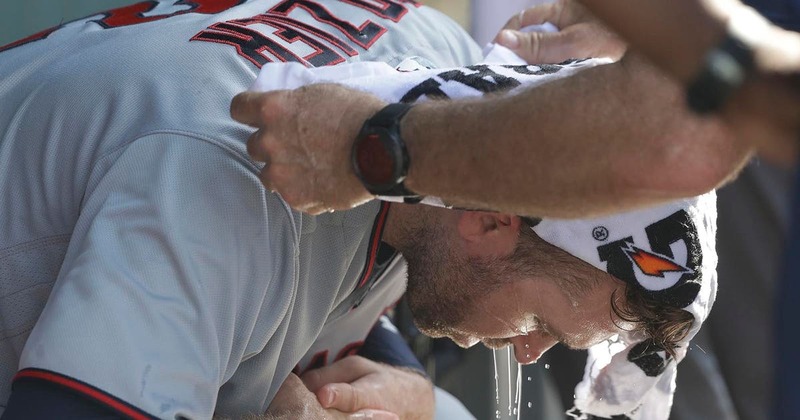 CHICAGO — Minnesota’s Eddie Rosario, Bobby Wilson and Max Kepler all left early because of heat illness on a scorching afternoon at Wrigley Field, and the Chicago Cubs beat the Twins 14-9 Saturday. Rosario homered in the top of the fifth inning, then was pulled from left field shortly after fielding a hit by Anthony Rizzo in the bottom half. The Cubs said it was 96 degrees at the time with a heat index of 107 — that’s a calculation of how hot it actually feels, with the humidity factored in. Albert Almora Jr. had three hits and drove in two runs as the Cubs won their third in a row. He exited in the fifth after apparently injuring a leg running the bases. Willians Astudillo, primarily a catcher in the minors, made his major league debut and wound up playing center field for the Twins, his first time at that spot as a pro. He hit an RBI single in his first at-bat. Home plate umpire Hunter Wendelstedt worked with a towel draped around his neck and frequently left the field between innings. David Bote led off with a walk and Ian Happ doubled off reliever Trevor Hildenberger (1-2). It was Chicago’s 15th hit to that point — and first extra-base hit. After pinch hitter Kyle Schwarber was intentionally walked to load the bases, Heyward hit a soft liner that just scooted over the head of shortstop Ehire Adrianza — with the infield playing in — for an RBI single and a 10-9 lead. o plate Bote and give the Cubs a 10-9 lead. Baez hit a grounder up the middle, just out of Adrianza’s reach with the infield playing in, for two more runs. Cubs: RHP Carl Edwards Jr. (right shoulder inflammation) threw 19 pitches and got two outs during a rehab outing with Triple-A Iowa on Friday. Manager Joe Maddon said the reports were positive and that his “velocity was normal.” Edwards is expected to pitch again either Sunday or Monday.